Collaborative technologies such as video and telepresence aren't just changing the way people work, learn and communicate. They're also having an enormous impact on networks. That's the view of Cisco's Marthin de Beer, who delivered the opening keynote address at the InfoComm 2010 conference Tuesday in Las Vegas. De Beer, senior vice president of the Emerging Technologies Business Group at Cisco, said that collaborative technologies will force radical changes in network architectures in the near future. He pointed to research showing that video is now dominating network traffic and will do so to an even greater extent in the coming few years. Right now, he said, 50 percent of network traffic is video. Network video traffic been experiencing a compound annual growth rate of 40 percent and will continue to do so through 2013, when video will account for an enormous 90 percent of total network traffic. De Beer is predictably bullish on video and, especially, telepresence. Earlier this quarter, Cisco completed a $3.3 billion buyout of videoconferencing and telepresence solutions provider Tandberg to help it stake a claim in what Cisco has estimated to be a $34 billion market for collaborative technologies. He pointed to a future for collaboration that will make it easier for users to create and manipulate rich media and for IT departments to deliver these technologies while also cutting back on the need for end-user support. He added: "When it comes to rich human interactions, being able to easily create, find, share, consume and manage content is very important. And we believe the network, what we now term as 'medianet,' which you should think of as the evolution of the network that is ready for rich media,...will play a very important part." 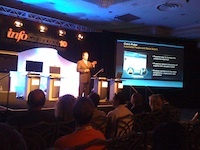 De Beer took the opportunity on stage to show off some Cisco collaborative technologies that are currently in the works (and some that have already been released). Those technologies include: highly accurate, on-the-fly speech to text capabilities within telepresence settings; real-time indexing of spoken terms for later searching of recorded materials; platform-neutral content (including for the iPhone and iPad); and simple production capabilities, such as prebuilt lower thirds. He also spoke of a technology "a few years" out that will allow for audio translation of spoken communications from one language to another. He cited the example of a person speaking Chinese while a listener on the other end of the conversation hears the words in English, with the translation happening in real time. "Video and collaboration, and, in particular, telepresence [are] at the heart of how the future of work, the future of connected life and the future of computing will change over time," de Beer said. "I believe it's just the beginning. We're going to see an exciting world unfold in front of us."